Today, consumers are visiting the Web much more than the doctor’s office for their healthcare needs. The average U.S. consumer visits the doctor three times per year but spends almost 52 hours searching online for health information. These are just a few of the important findings from a recent consumer survey conducted by Makovsky Health and Kelton. Apparently, the Internet has clearly become the go-to medical resource for today’s on-the-go consumers who want instant access to medical information. With consumers so likely to check the Web for wellness information, healthcare brands need to develop a healthy online presence in order to reach the consumers they’re trying to treat. The study reveals that physicians are a major catalyst in this quest for online medical research, with 51% of patients visiting a pharma brand’s website following a doctor’s diagnosis. And while WebMD is the most visited online resource for healthcare information, social media channels continue to gain popularity as medical sources. Nearly one-quarter of consumers seek healthcare information from social media, such as Facebook, Twitter, YouTube videos, and blogs. “The survey results demonstrate that even as consumers research health-related information online, they seek trusted resources for that information–their physician, or a fellow patient,” said Gil Bashe, executive vice president and practice director, Makovsky Health. Since consumers are actively seeking relevant and reliable healthcare information on the Web, this is the ideal opportunity for healthcare brands to establish themselves as online help lines for patients and their caregivers. This can be easily accomplished by developing websites and social media identities that educate, engage, and encourage ongoing dialogue. With these worthwhile online efforts, brands can position themselves as credible and compassionate sources of support and ultimately earn the trust, loyalty, and recommendation of consumers. It’s important to realize that an effective online presence extends far beyond the desktop computer today. The ubiquity of mobile devices and the on-the-go lifestyle of modern consumers mean that people are accessing healthcare information from anywhere and at any time. As a result, healthcare brands need to ensure that their Web presence and properties are all optimized for viewing on all digital devices, especially smartphones and tablets. In fact, tablets have seen a 7% rise in usage in the past year alone. Whether driven by a physician’s prescription or a personal quest for knowledge and support, more and more consumers are turning to the Web for their medical matters. These people are seeking to find information, guidance, and support from sources they can trust. That’s certainly the perfect opportunity for healthcare brands to show up in their searches with the medical knowledge, patient insight, and helping hand that can save the day and ultimately save their lives. 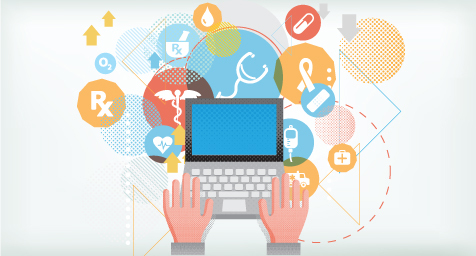 Develop a healthy Web presence for your healthcare brand. Contact MDG Advertising today at 561-338-7797 or visit mdgadvertising.com.